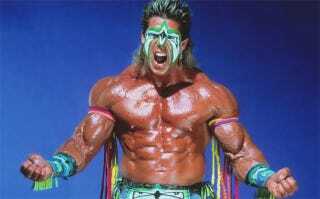 The WWE is reporting that The Ultimate Warrior (born James Brian Hellwig), has passed away at the age of 54. Just days ago, he was present at Wrestlemania 30. He is survived by his wife Dana and his two daughters. I haven't been into wrestling for over 15 years, but when I was a kid, damn. His fight against Hulk Hogan at Wrestlemania VI was one for the ages. UPDATE - TMZ reports that he "collapsed outside an Arizona hotel...while walking to his car with his wife". He was transported to a nearby hospital, where he was pronounced dead.